First-ever patented Chair Cape™ that celebrates Terry McGinnis as Batman from the 1999-2001 animated TV series. 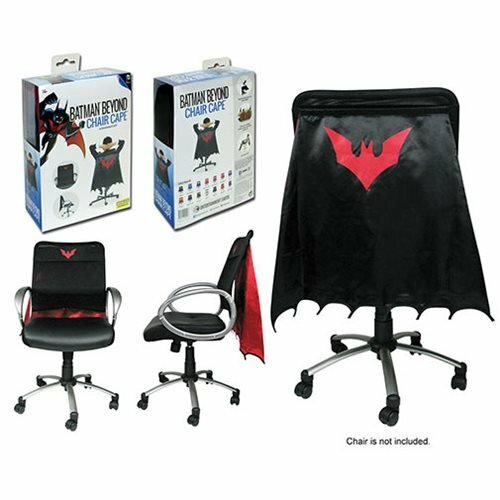 Bring some excitement to your boring chair with Batman Beyond Chair Cape - Convention Exclusive from Entertainment Earth! Made of high-quality fabric materials, the patented Chair Cape line from Entertainment Earth adjusts to fit most size chairs by using an adjustable hook and loop belt and strap design to wrap securely around the back of your chair. Limited to just 1200 pieces, this exclusive Batman Beyond Chair Cape celebrates Terry McGinnis as BATMAN™ from the 1999-2001 animated TV series and features the iconic red bat-emblem on a black cape with an adjustable black chair strap. Measuring 24-inches long and 30-inches wide, this Batman Beyond Chair Cape - Convention Exclusive will transform your tame chair into a seat fit for a hero ready to save the day! Plus as an Entertainment Earth Convention Exclusive, each limited edition Batman Beyond Chair Cape is individually numbered with a holographic sticker. Ages 14 and up. Exclusive WONDER WOMAN™ and BATMAN BEYOND™ Chair Capes!